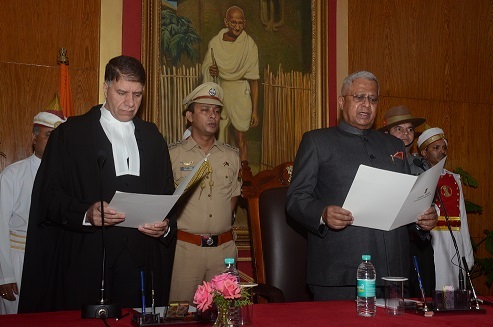 Chief Justice of the Meghalaya High Court, Justice Mohammad Yaqoob Mir administered the oath of office and secrecy to newly appointed governor Tathagata Roy on Saturday. Roy takes over as the governor of Meghalaya after being transferred from Tripura, the state he had served as governor since May 20, 2015. “I have set my mind to stay in Tripura for three years … but coming to Meghalaya and Shillong is like homecoming,” reminisced Roy after taking his oath of office at the Raj Bhavan here on Saturday. Roy swore in the name of God as he read out his oath in a short swearing-in ceremony attended by chief minister, Conrad K Sangma, ministers, Congress MP Vincent H Pala and police and civil officers of the state besides BJP leaders and few RSS functionaries. No MLAs from the opposition Congress were seen at the function. Roy replaced Ganga Prasad who has been transferred to Sikkim within a year of taking over as the governor of Meghalaya on October 5 last year. Roy had a close association with Shillong. He spent his childhood years in this hill city and his younger brother, the MP in West Bengal Prof Saugata Roy, was also born at the Ganesh Das Government Hospital at Lawmali here. The 73-year old governor was born on September 14, 1945 in Kolkata and had served as professor of Construction Engineering at Jadavpur University. In politics, he was the member of the Bharatiya Janata Party and was the president of the West Bengal state unit of BJP from 2002 till 2006. He was a member of the BJP national executive, the party’s central policy making body from 2002 till May, 2015. In a brief chat with media persons, the new governor expressed his regret for not getting to complete his term in Tripura, though more than happy to come to Meghalaya. “Moving from Tripura to Meghalaya, I was a little bit sad because I have set my mind to stay there for three years. But I am happy because coming to Meghalaya and Shillong is like homecoming. I had spent my early childhood years here, and my next younger brother, Saugatha Roy was born here at the Ganesh Das Government Hospital. This city I know like the back of my hand all the way from Garikhana to Happy Valley,” a delighted Roy expressed. Narrating his attachment further, Roy said that all his relatives who were in Shillong have died and their descendants strewn all over the world. “My last relative was my cousin very close cousin, Heralal Roy, who was a professor at St Anthony’s College here. He was quite a famous person in his own time and he died longtime back about 30 years back. I have a close attachment to this place and I am very happy,” Roy said. Lamenting at the change that Shillong city had undergone between his childhood years and now, the governor recalled how Shillong was free from traffic jam unlike now. “The look of the city has changed. When we were children, there was no traffic jam. There were all Assam-typed buildings, and none of these monstrosities that have grown up now. I would like to address these matters of architecture of Shillong at some point of time. But in spite of everything, Shillong is Shillong and I love it,” Roy said. “If good public transport is arranged, then the road occupancy will be less. In what way private transport will be discouraged is up to the elected government to decide. These are general ideas I have coined earlier also,” the governor winded up.